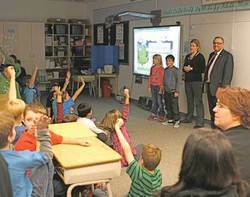 Nov. 24, 2013 8:00 p.m.
Leduc Mayor Greg Krischke (Standing on far right) was the surprise guest for the Grade 4's at Notre Dame School as they learned all about recycling and the five streams of garbage that the City of Leduc employs. Mayor Krischke participated in playing the online game "Toss and Sort" with four lucky students. This game can be found on the City's website under the heading "Recycle". Photo by Lorna Lowe.